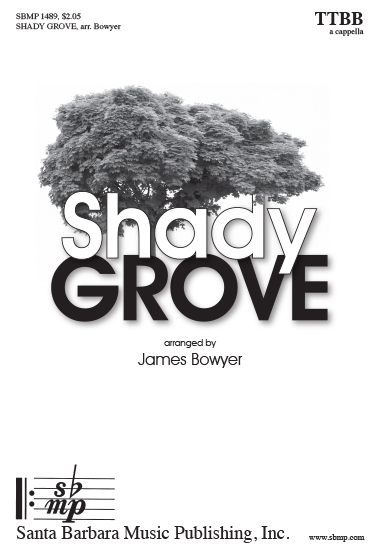 Shady Grove, arr. James Owen Bowyer | Santa Barbara Music Publishing, Inc.
Used to have an old banjo, the strings were made of twine. Peaches in the summer time, apples in the fall. If I can’t have the one I love, I don’t want none at all! Cheeks are red as the blooming rose, eyes of deepest brown. You’re the darling of my heart. Stay till the sun goes down. Higher in the cherry tree the riper grow the cherries. The sooner you begin to court, the sooner we can marry! When I was in Shady Grove I heard the pretty bird sing. The next time I’m in Shady Grove I’ll bring a diamond ring!